Today I was thinking about a friend and his family. I wrote a text and almost didn't send it because I didn't want to be a bother. Little did I know what was going to happen next. Within minutes of sending a short message, a text came back. He had just said a prayer asking for comfort and within minutes my text, that I thought to be just a passing thought, went through. Tears filled my eyes because I knew it was the warmth of our Heavenly Father showing both of us love through tender mercies. As I sat their for a moment, a song came to mind. The words were perfect so I thought I would share them. Come in times of need. Fill us as we plead. Help us feel God’s love. For which our spirits yearn. By small and simple things are great things brought to pass. All we need to do is stop and listen. What a beautiful day. My Becoming More journey for this month has been amazing and eye opening as I am constantly remembering moments long past that I have been blessed by the grace and love of my Heavenly Father. This week I was reading about Alma, who had just heard the words of Abinadi and believed what he had spoken. He tried to plead with King Noah to spare Abinadi, but was cast out. He fled and hid from the servants of the king who had been sent to kill him. He repents and begins going about privately preaching to the people about the words of Abinadi. The people who believed his words followed his path and came to know the Lord. Their hearts changed and they entered into the covenant of baptism. 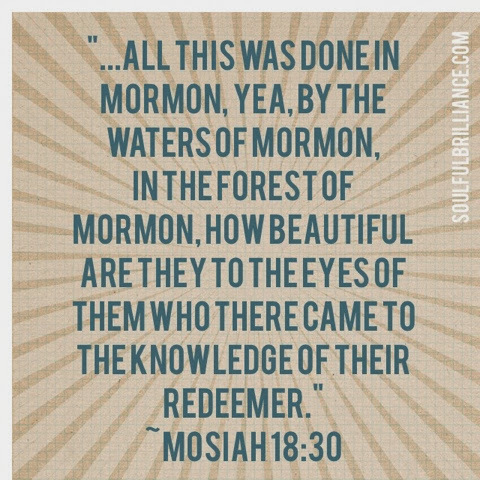 In verse 30 it tells us, "...all this was done in Mormon, yea, by the waters Mormon, in the forest of Mormon, how beautiful are they to the eyes of them who there came to the knowledge of their Redeemer." It wasn't really the scenery that made the place beautiful, it was that it was the place they came to know the Lord personally. In the book Becoming His, The author talks about hot this is common in scripture stories. It made me start thinking more about my own waters of Mormon experiences. I've already share many of them with you here on Soulful Brilliance, but there are so many more! Many of them very sacred to me. There was the time as a teenager when I knelt in my room and prayed to know once again of the truth of the Book of Mormon. I was filled with peace and comfort. I felt the Spirit so strongly that night. There was a time standing on a bustling city street in China. I realized how many people there truly are in the world, and I felt the love Heavenly Father has for each and every one of those people individually, especially the love He feels for me. I knew more deeply of His love and acceptance of me that night on a crowded street in a foreign country than I ever had before. Most of my other experiences happen in on of my favorite places--the temple. Honestly when I think of most experiences that are important spiritual experiences wherever we are at the time really is a temple. Alma and the people of King Noah had a temple at the waters of Mormon. I had a temple in the busy Chinese street. I've had a temple in my bedroom. I've had a temple when I was out in nature enjoying God's creations. On my rock. Sitting at the bedside of my Great Grandmother at the end of her life. In my car. Our waters of Mormon experiences can happen anywhere! They are exactly what we need. When we need it in our life. Giving us answers. Giving us comfort. Giving us the knowledge that the Lord is mindful of us and will help us if we let him in! As I type this I'm reminded of an article from the Sept. 2009 Ensign by Jeffery R. Holland called "Lessons from Liberty Jail." In it Elder Holland talks about how "Until his martyrdom five and a half years later, there was no more burdensome time in Joseph's life than this cruel, illegal, and unjustified incarceration." Joseph and the other brethren were kept in the dungeon that was barely six feet tall, and because most of them were over six feet tall, they couldn't stand up straight and were constantly in a stooped position. They were given contaminated and sometimes poisoned food. Joseph spoke in letters of the jail being a "hell, surrounded with demons...where we are compelled to hear nothing but blasphemous oaths, and witness a scene of blasphemy, and drunkenness and hypocrisy, and debaucheries of every description." And yet, this prison has been called by general authorities a "prison-temple." About this Elder Holland says, "So in what sense could Liberty Jail be called a 'temple,' and what does such a title tell us about God's love and teachings, including where and when that love and those teachings are made manifest? In precisely this sense: that you can have sacred, revelatory, profoundly instructive experiences with the Lord in any situation you are in. Indeed, you can have sacred, revelatory, profoundly instructive experiences with the Lord in the most miserable experiences of your life--in the worst settings, while enduring the most painful injustices, when facing the most insurmountable odds and opposition you have ever faced....every experience can become a redemptive experience if we remain bonded to our Father in Heaven through it. These difficult lessons teach us that man's extremity is God's opportunity, and if we will be humble and faithful, if we will be believing and not curse God for our problems, He can turn the unfair and inhumane and debilitating prisons of our lives into temples--or at least into a circumstance that can bring comfort and revelation, divine companionship and peace." He loves us! I know He does! He wants to help us! We get to hold on and have faith! We get to learn and grow in the hard times and in the good times. We can find comfort. We can find peace. We can find answers. All we have to do is have faith and look for "waters of Mormon" experiences in our lives. They are there if we look for them and recognize them. Looking back over the last year I am so amazed at how my HeavenlyFather has led and guided me to where I needed to be. One of my goals last year was to work hard to really study my scriptures and learn more about the Gospel. 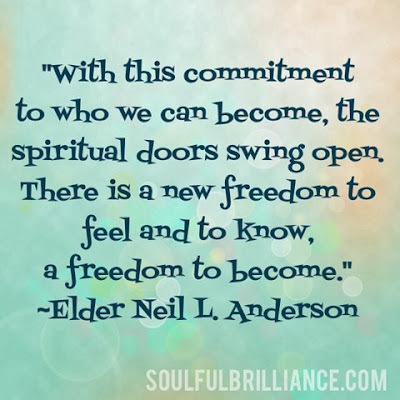 I made that commitment to become a better disciple of Christ through something little, and I definitely saw the spiritual doors swing open to a new freedom to feel and know and become. 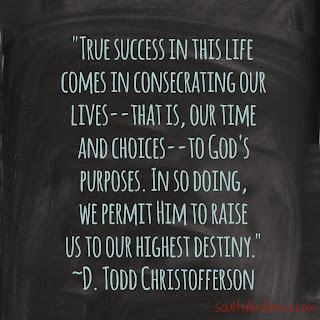 To learn what my Heavenly Father needed me to learn. I know that as I worked on that goal I was blessed greatly for it. There were definitely days, weeks, and yes even months where I struggled, but overall I definitely progressed in my gospel study. As one of my favorite writers says, "Progress not perfection is the goal." As I was working on writing my new goals, I contemplated those blessings I recieved and the progress I had made spiritually. I knew that I wanted to become even more than I had before. 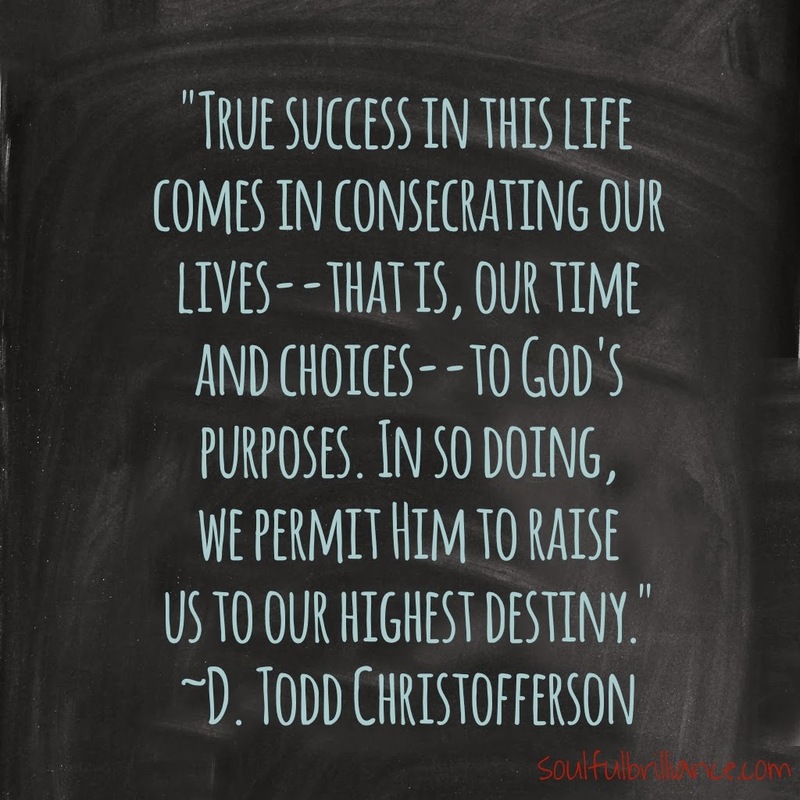 I wanted to dig deeper, to learn more of my Savior, and to truly devote myself to building up the kingdom of God. So I wrote some new goals. Even bigger goals than just studying the Gospel. To reach these goals, I have a lot of little things that I am desiring to accomplish. One of them is to read a book I found by Emily Freeman called Becoming His. In this book is 12 chapters, one for each month. I've already started the first chapter called "Becoming More", and I have been contemplating so many new things and recalling times when the Lord has blessed me and answered my prayers. I would like to just share with you once or twice a month my thoughts and feelings about what I am doing. If you have a chance, go pick up the book and join me on this journey. It's going to be awesome! I am truly committed to becoming more than I already have become and working towards an even better relationship with the Lord! I'll start sharing more in a few days. I hope you have some awesome goals to accomplish this year! If you haven't started on them yet, get ready because I'm going to be writing about the process I use to write goals and sharing some of my goals with you! Check back on Friday night for the first post! My heart is so full right now! I've been working the last month on reviewing my year and writing my new goals for 2014. Part of my process is going through my old journals for the year and looking back at what I learned through my life experiences both good and bad. I have had the most amazing year of my life! What a blessing it has been to experience all I have! Reliving all those moments again I remembered all the lessons I learned. Some of them I wouldn't have chosen to learn in the way I learned them had I been given a choice at the beginning of the year, but I am truly grateful for each lesson learned. Lessons like determination and courage. The importance of being present and enjoying the little moments in life. The power of prayer and patience when looking for answers. The realization that even though I may not have had huge traumatic experiences in my life, I can use my normal little life experiences and knowledge to inspire others to live their best lives. There were moments when my heart was overflowing with sweet love and gratitude that words could not express. Moments when lifelong dreams became reality. The surprise moment of being asked to marry the love of my life. All these moments come together in the perfect symphony whose beautiful highs and lows remind me that a happy life isn't a life of ease and comfort, but a balance of joy and pain, easy answers and challenges, tender mercies and trials. And through it all is the loving, supportive hand of the Savior gently leading us on the path to eternal life. Helping us along when we struggle. Forgiving and sanctifying us when we sincerely repent of wrong doing. Allowing us to learn the lessons we need to learn in order to become more like our Father in Heaven. Rejoicing with us when we overcome. I am so thankful for the path I have been led on. I have learned so much and gained a greater testimony of the love and power of the Atonement. Recently one of my church leaders suggested that I write down my experience of being single for all these years and how I continued to build my testimony and have faith. A friend also asked me what I did to attract such an amazing guy. The answer to that, I know, is that I was being led by a loving Heavenly Father on the perfect path for my life. I know that all the hard things we experience in life, all the trials and heartaches, no matter what they are, are for our learning and for our good. For me a big one was being single. For others it could be disease, depression, death of a loved one, and so many more. There are many things that I've learned that I'd like to share some of that so others can no matter their trial. Unfortunately it would take some major time to write them all down for you. So we'll start with one of the big tools I have learned: surrender. I know I've talked about this before, but it's such a powerful tool that I'm going to talk about it again! :0) if you missed that post click here. A couple weeks ago My-Handsome-Guy-with-the-Killer-Smile was sharing a scripture with me that I found illustrated surrender in an amazing way. It is in Ether 6 and is the story of the Jaredites crossing the ocean to the promised land. In earlier chapters we learn that the Jaredites language was not confounded at the Tower of Babel and the Lord promises to lead them to a choice land and make them a great nation. The Lord leads them through the wilderness until they come to the "great sea which divideth the lands" (Ether 2:13). They pitched their tents and lived there for four years. After four years the Lord comes to the brother of Jared and chastens him for not calling on the Lord. He repents and the Lord instructs him to go and build barges like they had build to cross other seas on their journey. They build the ships and prepare for the journey with light, water, food and their flocks. When they had done all they could to be ready, they got on their "vessels or barges, and set forth into the sea, commending themselves unto the Lord their God" (Ether 6:4). Their ships were not the kind of ships where they could steer with sails or other things. They were vessels built tight like a dish. They surrendered their lives to the Lord, trusting that the wind and waves would take them to the promised land. It wasn't an easy journey. In Ether 6:5-11, it tells how "...the Lord God caused that there should be a furious wind blow upon the face of the waters..." They were "buried in the depths of the sea." There were "mountain waves which broke up on them" and "great and terrible tempests which were caused by the fiercemess of the wind." And what did the Jaredites do? "They did cry unto the Lord." "They did sing praises unto the Lord...and...did thank and praise the Lord all the day long...they did not cease to praise the Lord." Finally after a being in the ocean on their vessels for 344 days, they landed on the shore of the promised land. Our lives are very much like the journey of the Jaredites. We have righteous desires in our lives. We can do everything we have the capacity to do to prepare for a situation or to change a situation, but there comes a time when we arrive at a shore looking out at a "great sea" and get to surrender to the Lord's will for us. It won't always be easy. Just like the Jaredites, there will be storms pushing us in the correct direction towards our own promised land, but we can do it with His help! One I righteous desire I had was to find my own prince charming and be married in the temple. I did everything I could and got as far as I could go and then I came to a "great sea" and I realized that there was really nothing more I, myself, could do. During my journey of getting to this "great sea" of mine, I had been led by my Heavenly Father, and He had prepared me for what would come next in my life. I commended myself and my life to Him. I surrendered! I surrendered in a way I never had before. I not only gave my situation to Him to lead me where I wanted to go, I gave Him all the pain and hurt and unrealized dreams, and I made a promise to Him that I would do everything in my power to help and serve others instead of worrying about my situation. After that I got to work. I took small steps and everytime I was overwhelmed with loneliness or heartache or frustration, I would pray and look for the tender mercies that surrounded me everyday. I thanked Him for those blessings. I kept myself anxiously engaged in assisting others. I trusted that His timing was going to be perfect for my life. And it was! Looking back on my journey of singlehood, it was full of learning opportunities that were hard to get through, but they helped me learn and grow and become who I need to be to get to this promised land. In all my daydreaming and list making, I never imagined how amazing and maginificent it would be to be here. I'm so thankful for all that my Father in Heaven has blessed me with in my short life. If there is one thing that I could give to you it is the faith that Heavenly Father is very aware of you and your storms. I know that our trials and challenges are learning experiences to help us become who we need to be in order to reach and fully appreciate the better promises God has for us. If we can hold on and have faith and trust in our Heavenly Father no matter how long it takes, He will bless us with a promised land far and above anything we ever dreamed! He has better promises for us!